I know! How good do these look? To many garden post for my readers I'm sure, but look at them! Aren't they beautiful? The basil is from my garden too. Not the cheese though, no cow or goat in they yard--so says Ed. Guess I'll listen to him since we don't have a fence and I'm sure the neighbors might not be happy about livestock in their yards. I made these for a quick dinner and my son and daughter-in-law's house this weekend. They needed a tiny bit of help from Ed to get it set up so they invited us for dinner. Since these tiny Roma grape tomatoes were ready I fancied them up just a bit. It was easy, slice and dig out the guts (how do you like that for a cookbook description?) of the tomatoes, drain them upside down for 5-10 minutes. 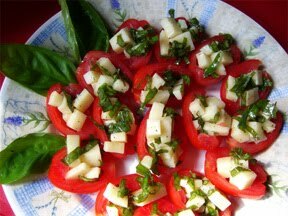 In a small bowl chop up some mozzarella cheese, make some ribbon basil, add salt and pepper and a few glugs of olive oil. Put that in the fridge about 15 min. then stuff the tomatoes. Whew, I'm tuckered out after writing all of that. Maybe we'll go out for dinner tonight. What do you like to do with tomatoes? I like tomatoes just like that. Thanks Casey, I love them too. Now THIS MAKES ME SOOOO hungry! I am raising tomatoes and have organic cheese and olive oil (but not glups of it, LOL) and might actually can make this! oh Patti, you have to try it, soooo good!